Following three straight years of underperformance, healthcare REITs showed signs of life in 2018. The early tremors of the long-awaited demand boom are finally beginning to appear. The investment thesis related to the “aging population” has been no secret. The healthcare real estate industry - especially senior housing –continues to battle an “addiction” to new supply growth. For senior housing, supply pressures are expected to linger throughout 2019 as expense growth continues to outpace revenues. These REITs have been reluctant to call a bottom to fundamentals. Operator struggles and policy uncertainty continues to trouble Skilled Nursing and Hospital REITs. Don’t expect the political rhetoric or uncertainty to moderate heading into the 2020 presidential election cycle. The REIT Rejuvenation - and its impact on equity valuations – should be a jolt of adrenaline for a sector that relies on a strong cost of capital to fuel external growth. In our REIT Rankings series, we analyze each of the commercial and residential real estate sectors. We analyze companies within the sectors based on both common and unique valuation metrics, presenting investors with numerous options that fit their own investing style and risk/return objectives. We update this report every quarter with new developments. 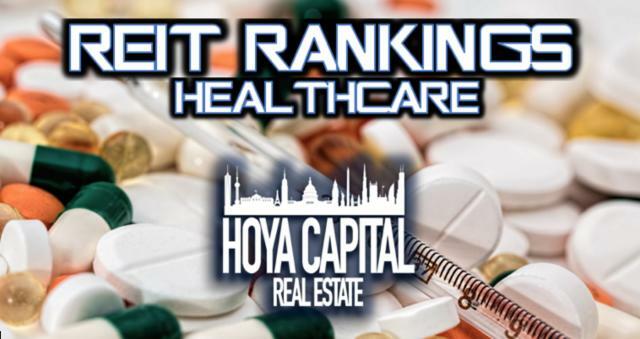 Within the Hoya Capital Healthcare REIT Index, we track 11 of the largest healthcare REITs, which account for roughly $120 billion in market value: Alexandria Real Estate Equities (ARE), Welltower Inc. (WELL), Ventas Inc. (VTR), HCP Inc. (HCP), Omega Healthcare Investors (OHI), Healthcare Trust of America (HTA), Medical Properties Trust (MPW), Sabra Health Care REIT (SBRA), Healthcare Realty Trust (HR), National Health Investors (NHI), and Physicians Realty Trust (DOC). Healthcare REITs comprise roughly 10-15% of the REIT Indexes (VNQ and IYR) and own approximately one-tenth of the total $2 trillion worth of healthcare-related real estate assets in the United States. Healthcare REITs tend to lease properties to tenants under a long-term, triple-net lease structure, though these REITs have taken on increasingly more operating responsibilities over the past decade. This is largely a function of REIT regulations that limit the ability of these companies to operate healthcare facilities in-house. For that reason, a unique feature of healthcare REITs is the critical importance and reliance on third-party operators, many of which have struggled to remain profitable in recent years amid rising costs and lower reimbursement rates. 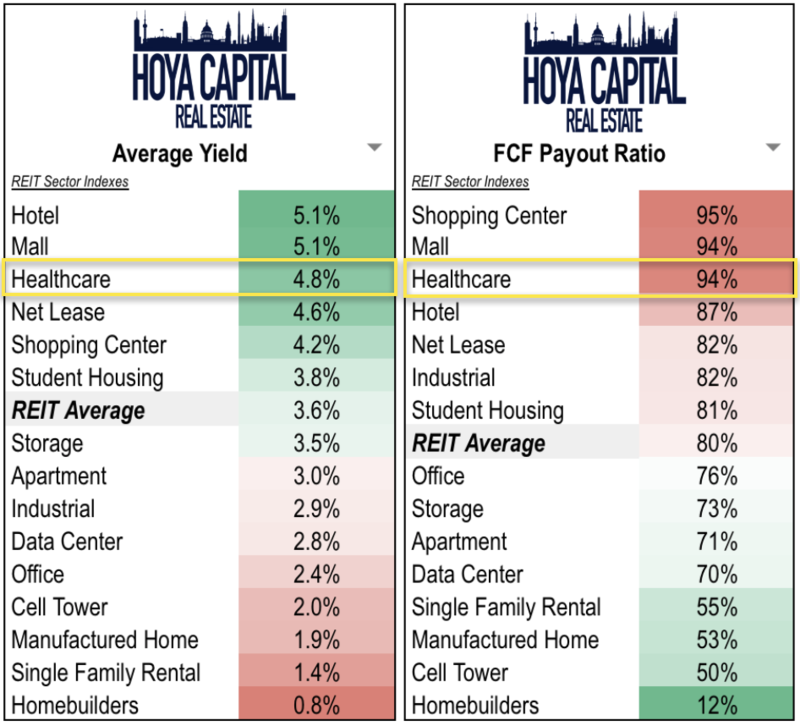 Healthcare REITs have historically been a "defensively-oriented" sector that generally pay a high dividend yield and are used by many investors as effective "bond proxies." 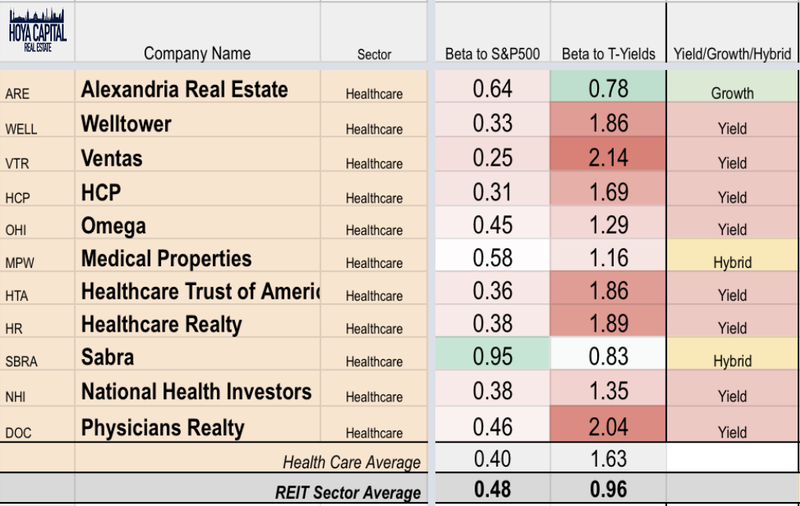 There are five distinct sub-sectors within the healthcare REIT category, and each of these sub-sectors has separate risk/return characteristics. As we'll discuss in more detail shortly, the Affordable Care Act pushed more of the financial risk from payors (insurers and government) onto healthcare providers (doctors, hospitals, healthcare facilities), which has pressured the healthcare real estate sector, particularly at the higher-cost end of the spectrum. 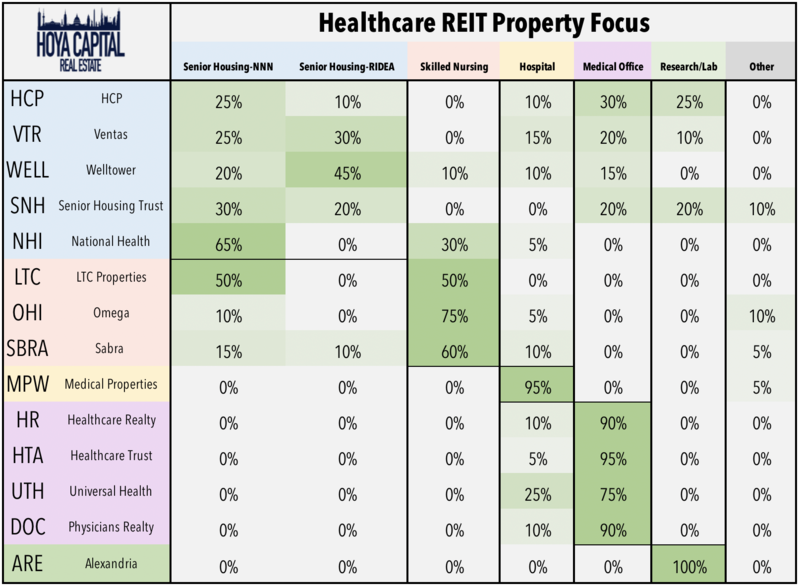 Healthcare REITs tend to focus on a single property type, but the "big three" REITs (HCP, VTR, WELL) hold a fairly diversified portfolio across the healthcare spectrum. Relative to the total value of US healthcare real estate assets, REITs are overweight in the senior housing and skilled nursing sub-sectors, equal-weight in the medical office and life science sub-sectors, and underweight in the hospital sub-sector. The foundation of the bullish thesis for healthcare real estate typically centers around very favorable demographics, the result of a historically large generation of aging "baby boomers" as well as advances in medical technology that have extended average life expectancies. 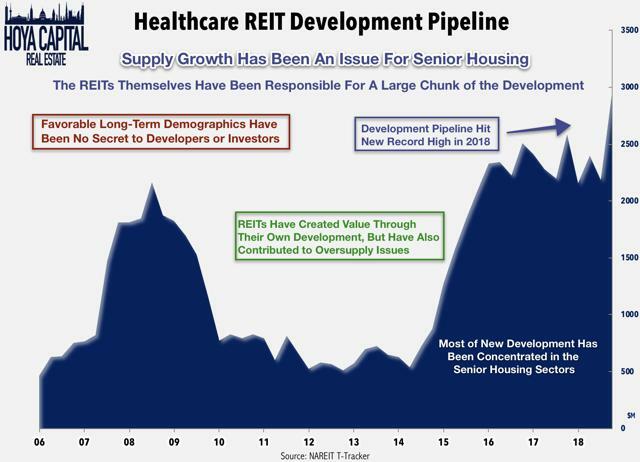 After years of relative stagnation, the long-awaited demographic boom is finally in sight for healthcare REITs. 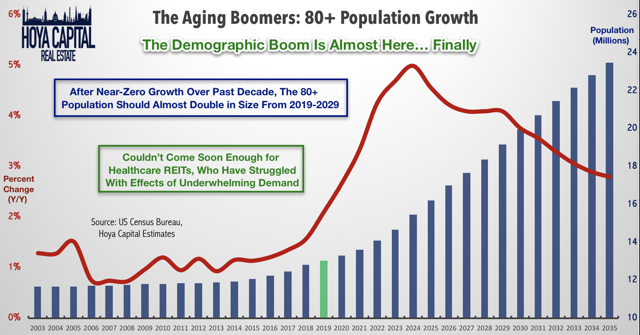 The 80+ population will see substantial growth over the next two decades. 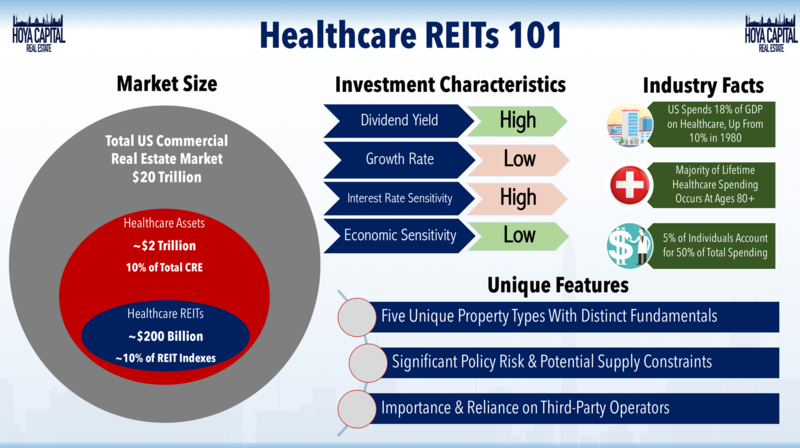 Healthcare REITs have historically used acquisitions, funded with a favorable cost of equity relative to private market companies, to fuel accretive external growth and have produced the best average annual return out of the major REIT property sectors since the mid-1990s. 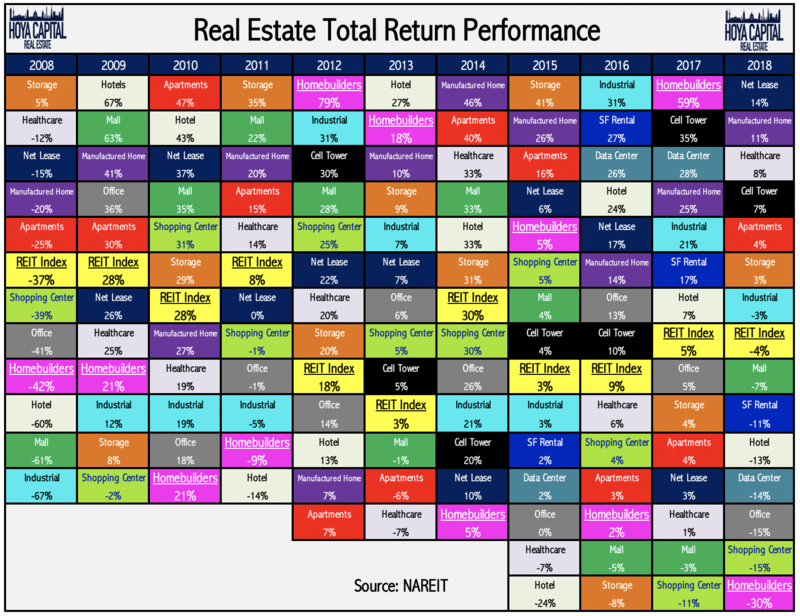 The REIT Rejuvenation - and its impacts on equity valuations - should be a jolt of adrenaline for a sector that relies on a strong cost of capital to fuel external growth. 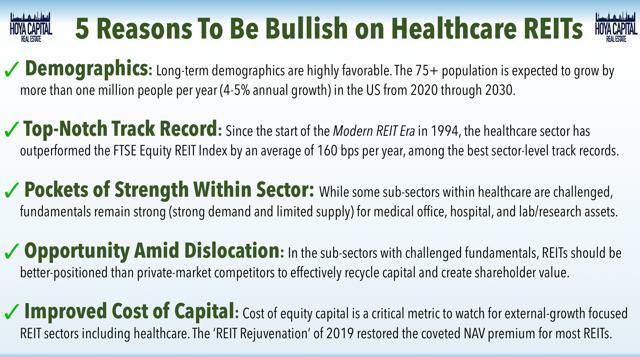 Below, we outline five reasons that investors are bullish on healthcare REITs. The "aging population" investment thesis has been no secret, however. 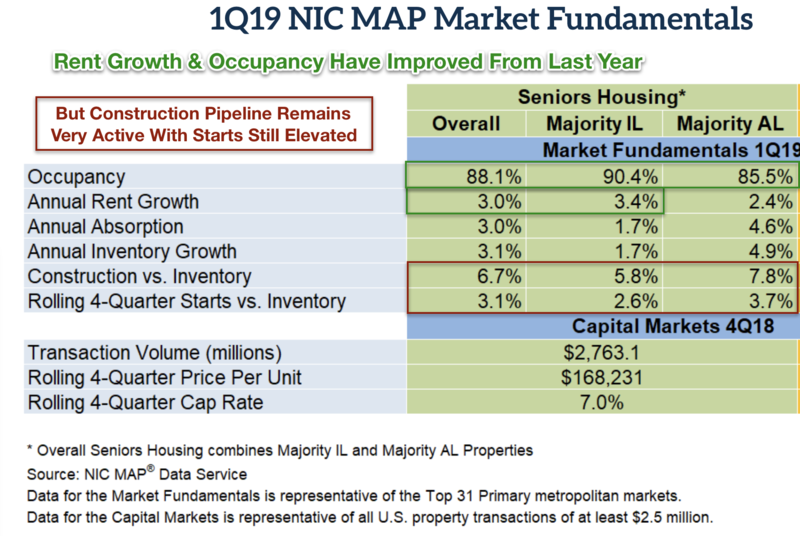 The healthcare real estate industry - especially senior housing - continues to battle an "addiction" to new supply growth which will continue to weigh on fundamentals. 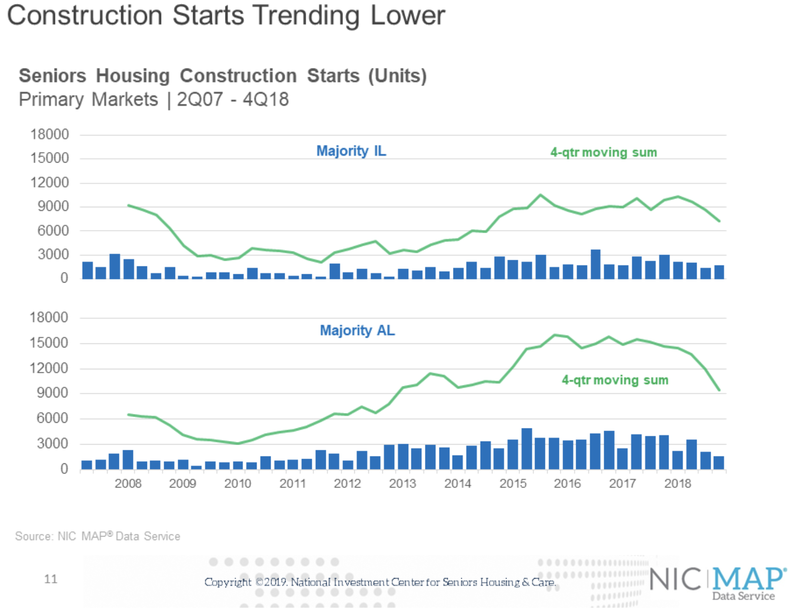 While private-market metrics suggest that development starts have pulled back in recent quarters, given rising construction costs and weaker development yields, supply pressures will continue to linger throughout 2019 and into next year. Outside of senior housing, operator struggles and policy uncertainty continues to trouble Skilled Nursing and Hospital REITs, which assume a significant degree of policy-related risk. Medical Office and Research/Lab focused REITs have been the safe-bets in the sector over the past half-decade but trade at elevated valuations compared to other REITs. The bearish thesis typically focuses on the secular headwinds of the ACA on public-pay REITs, the oversupply issues that encumber the senior housing REITs, and the interest rate sensitivity of the sector. 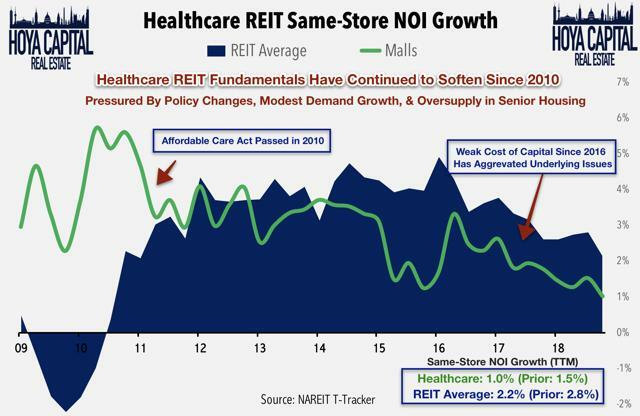 Healthcare REITs fundamentals continue to lag the broader REIT average, as they have for nearly the entire recovery, not entirely unexpected considering the defensive and recession-resistant nature of the sector. This underperformance, however, has been exacerbated by the aforementioned secular headwinds on the public-pay REITs and oversupply issues in the private-pay REITs. The underperformance gap has widened since 2015. Per data from NAREIT T-Tracker, same-store NOI ticked down to 1.0% in the fourth quarter of 2018 from 1.5% in 3Q18. 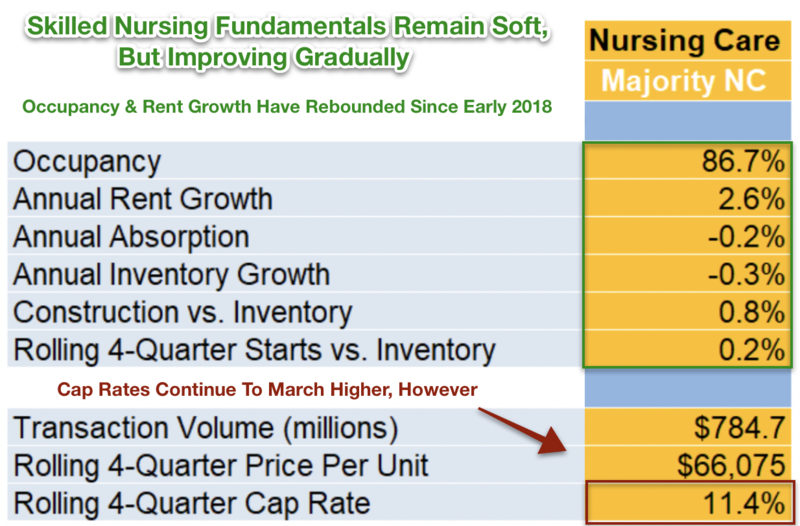 While demand has been predictably steady for most sub-sectors outside of skilled nursing, relentless supply growth over the past several years (almost entirely within the senior housing and MOB sectors) has weakened fundamentals. The internal development pipeline from REITs themselves illustrates the boom in construction activity that began in 2014 and is expected to continue into the next decade. As a percent of inventory, housing starts per year in the senior housing sector will likely average 3-4% per year from 2015 through 2020, significantly outpacing demand growth during this time. The pipeline reached a new record high of $2.8 billion at the end of 2018 after appearing to moderate in recent quarters. Investors are hoping to see signs of receding supply growth in 2019. 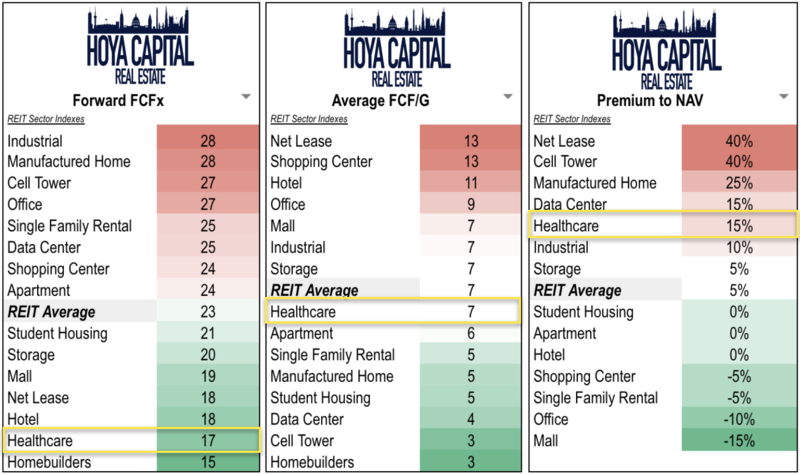 Healthcare REITs have offset some of the underlying property-level weakness by accretive external growth, but this growth was hard to come by in 2019 with a relatively weak cost of equity capital. On a trailing-twelve-month basis, healthcare REITs were net sellers of assets in 2018 for the first time on record. These REITs have historically utilized their cost of capital advantage over private market competitors to accretively expand the size and scale of the business and drive FFO growth. This prudent capital allocation has been responsible for much of the sector's outperformance. 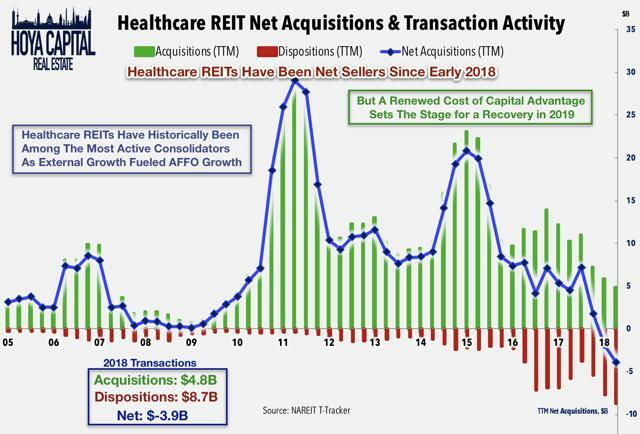 The relatively flat performance of the healthcare REIT sector over the past two years, coinciding with generally rising private market valuations, erased much of this cost of capital advantage, making acquisition-fueled growth more difficult. As discussed above, we think that the renewed cost of capital advantage enjoyed by these REITs follow the REIT Resurgence sets the stage for an acquisition recovery this year. The post-recession period has seen a continuous wave of consolidation within the healthcare REIT space. Recent M&A activity has focused on the vertical integration of healthcare operators, recognizing the critical importance of having healthy tenants amid broader operator struggles. Capital recycling activity in recent quarters has been well-received by healthcare REIT investors. Even as net acquisition activity has decreased in recent quarters, total transactions remain healthy at roughly $13 billion over the last twelve months, illustrated by the red line in the chart above. We expect healthcare REITs to be net neutral or slightly positive on the acquisition front as the sector enters 2019 with a modest NAV premium. Challenging fundamentals continued for the senior housing sector in 2018 driven by oversupply issues, which has weakened rent growth as expenses - particularly labor costs - continue to rise mid-single-digits. Fourth-quarter results were mixed in the senior housing sub-sector, and full-year guidance for 2019 reflects the fact that REIT executives are still hesitant to call a bottom to fundamentals. RIDEA same-store NOI growth remains weak at -4.8% YoY. With labor accounting for roughly two-thirds of total operating expenses, tight labor market supply conditions for nurses and doctors continues to pressure wage costs even as revenues remain flat. There is hope on the horizon, however, as National Investment Center data shows that construction starts are finally beginning to trend lower. Senior housing starts have moderated from 2017 peaks as rising construction costs and lower expected development yields have finally put a dent in development appetite. Investors will be watching this data closely throughout 2019, but even if starts continue to trend lower, expect supply issues to linger well into 2020. NIC data for the first quarter of 2019 show a mild improvement in rent growth and occupancy from late last year as absorption figures have improved even as the development pipeline remains high. We expect these absorption figures to begin to trend sustainably higher beginning within the next two years as the long-awaited demographic boom begins to be realized. The skilled nursing and hospital sectors continue to be the targets of policy-makers seeking to reduce aggregate healthcare costs, and policy changes enacted under the Affordable Care Act have resulted in shorter lengths of stay, lower reimbursement rates, and lower occupancy rates. Omega and Sabra are still actively trying to contain the damage from struggling operators by offering concessions and rent reductions to these tenants in an effort to keep them solvent, a theme that abated a bit in 2018. Rent coverage was fairly stable in 2018, as EBITDARM remained stable in 4Q18 from the prior quarter. We continue to believe that these REITs are better positioned than smaller SNF owners to work out favorable deals with operators that may result in short-term pain but longer-term gain. However, our outlook for the broader sector remains weak as we see continued market share loss to lower cost options include other senior housing REITs and home healthcare, fueled by technological improvements that lessen the need for at the margins for high-cost skilled nursing care. Per NIC data, national SNF rent growth averaged 2.6%, up from last quarter, following a steady linear downtrend since 2016, when rent growth was averaging nearly 4.5%. Occupancy ticked up to 86.7% from 85.9% last quarter. 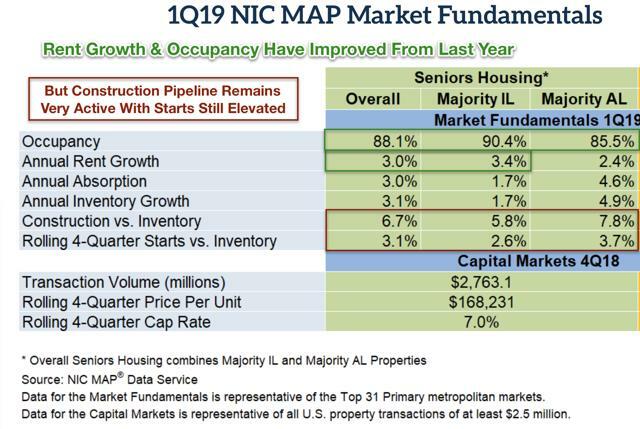 Unlike the senior housing sub-sector, supply growth is largely a non-factor in the SNF space, as annual inventory growth continues to be in net-negative territory. Cap rates have continued to reset higher over the last couple quarters, to 11.4% from an average around 10.0% last year. Omega and Sabra continue to sell underperforming assets and look to opportunistically buy stronger assets at attractive valuations from distressed private market sellers. The Medical Office Building and Lab Space/Life Sciences sub-sectors were the only places to hide within the healthcare sector in 2017 but were the laggards of 2018. Thought to be immune from the policy-related risks of the other sub-sectors, the supply/demand dynamics remain moderately favorable, but supply growth has remained elevated in recent years, offset by solid demand. SS-NOI remained steady with last quarter at 3%, with occupancy roughly flat. Following three straight years of underperformance, healthcare REITs showed signs of life in 2018. 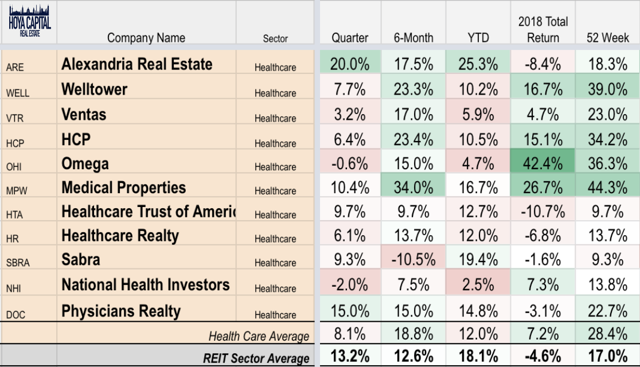 Despite recent underperformance, Healthcare REITs have been one of the best-performing sectors of the Modern REIT Era (1994-Present), outperforming the broader index by roughly 1% per year during that time. Along with a strong track record of prudent capital allocation, the low capex profile inherent with the triple-net lease model has been responsible for much of the long-term outperformance. 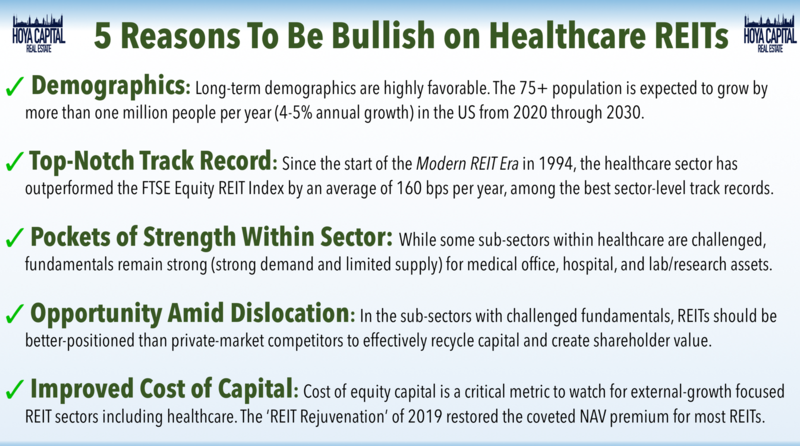 Following a strong 2018, healthcare REITs have stumbled out of the gate so far in 2019 despite a favorable macroeconomic backdrop of lower interest rates and signs of moderating global economic growth. 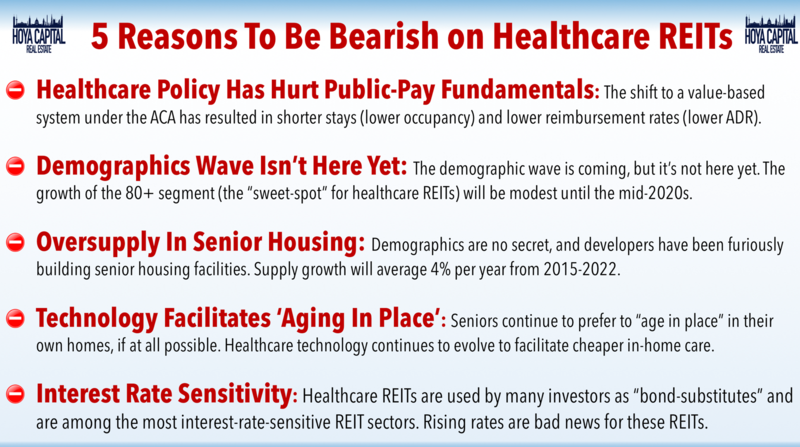 Typically, these "Goldilocks" economic conditions would be ideal for healthcare REIT outperformance, but supply-related concerns have pressured the senior-housing focused REITs. 2018 could largely be described as a "risk-on" year within the healthcare space, with previously beaten down names, including Omega and Medical Properties leading the gains, while the safe-haven names in the MOB and Research/Lab sub-sectors underperformed. So far, in 2019, Alexandria and Sabra have been the top performers, while National Health has been the laggard. Healthcare REITs trade at discounted valuations relative to other REIT sectors based on Free Cash Flow (aka AFFO, FAD, CAD) metrics. The sector now trades at a 10-20% premium to Net Asset Value, a reversal from the NAV discount experienced earlier in 2018, again giving the sector the ammunition to fund accretive acquisition opportunities, which have been relatively few and far between over the past since 2016. 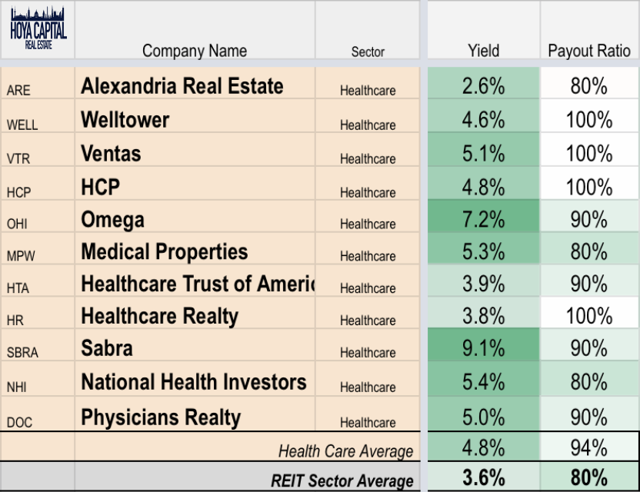 Healthcare REITs have historically been strong dividend payers and continue to rank towards the top of the REIT sector. Healthcare REITs pay an average yield near 5% but do so by paying out more than 90% of their available cash flow, based on our estimates. Investors who are looking for income and are willing to take on policy and operational risk can take a look at the skilled nursing REITs such as Omega and Sabra. Investors seeking more of a safe, predictable income stream would be better suited for the MOB or lab/research healthcare REITs such as Healthcare Trust, Healthcare Realty, Physicians Realty, or Alexandria. 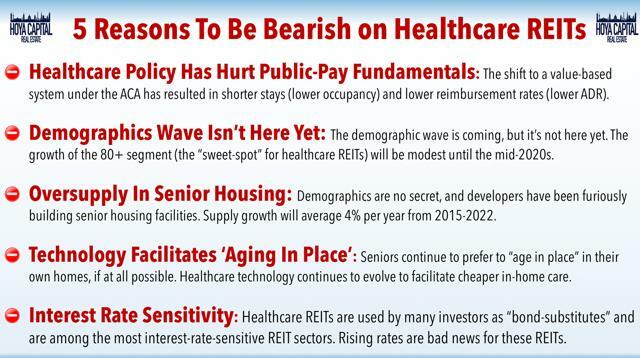 Healthcare REITs are among the most "bond-like" REIT sectors, meaning that these REITs are heavily influenced by movements in interest rates. The sector's high interest rate sensitivity is a function result of longer-than-average lease terms (10-15 years for triple-net healthcare leases), high dividend yields, and lower long-term growth prospects than the REIT average. We separate REITs into three categories: Yield REITs, Growth REITs, and Hybrid REITs. As a sector, healthcare REITs are firmly in the Yield REIT category. All healthcare names besides the Lab Space-focused Alexandria Real Estate Equities are highly sensitive to interest rates, and VTR and HTA are two of the most sensitive names across all REIT sectors. 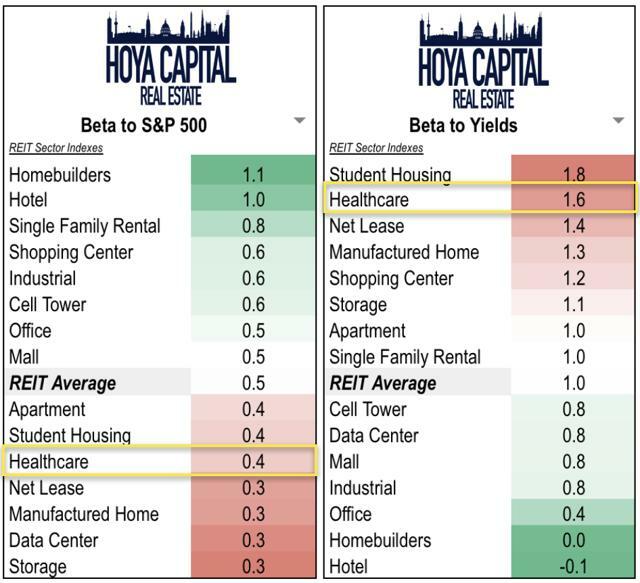 Notably, the acute care REITs exhibit lower sensitivity to yields and more sensitivity to the equity markets than other healthcare REITs. Following three straight years of underperformance, healthcare REITs showed signs of life in 2018. The early tremors of the long-awaited demand boom are finally beginning to appear. The investment thesis related to the "aging population" has been no secret. The healthcare real estate industry - especially senior housing - continues to battle an "addiction" to new supply growth. For senior housing, supply pressures are expected to linger throughout 2019 as expense growth continues to outpaced revenues. These REITs have been reluctant to call a bottom to fundamentals. Operator struggles and policy uncertainty continues to trouble Skilled Nursing and Hospital REITs. Don't expect the political rhetoric or uncertainty to moderate heading into the 2020 presidential election cycle. The REIT Rejuvenation - and it impacts on equity valuations - should be a jolt of adrenaline for a sector that relies on a strong cost of capital to fuel external growth. We continue to see a challenging environment for senior housing and public-pay healthcare REITs in 2019 but believe that the renewed cost of capital advantage over the private markets should grease the wheels for strategic M&A activity, the true competitive advantage that has powered healthcare REIT outperformance over the past three decades. For senior housing REITs, the demand growth is coming. It's just a matter of when and whether supply growth will moderate enough to let these REITs enjoy it. If you enjoyed this report, be sure to "follow" our page to stay up-to-date on the latest developments in the housing and commercial real estate sectors. For an in-depth analysis of all real estate sectors, be sure to check out all of our quarterly reports: Industrial, Data Center, Malls, Net Lease, Manufactured Housing, Student Housing, Single-Family Rentals, Apartments, Cell Towers, Manufactured Housing, Shopping Centers, Hotels, Office, Storage, and Homebuilders. Disclosure: I am/we are long VNQ, WELL, VTR, HCP, OHI, SBRA. I wrote this article myself, and it expresses my own opinions. I am not receiving compensation for it (other than from Seeking Alpha). I have no business relationship with any company whose stock is mentioned in this article. Additional disclosure: It is not possible to invest directly in an index. Index performance cited in this commentary does not reflect the performance of any fund or other account managed or serviced by Hoya Capital Real Estate. 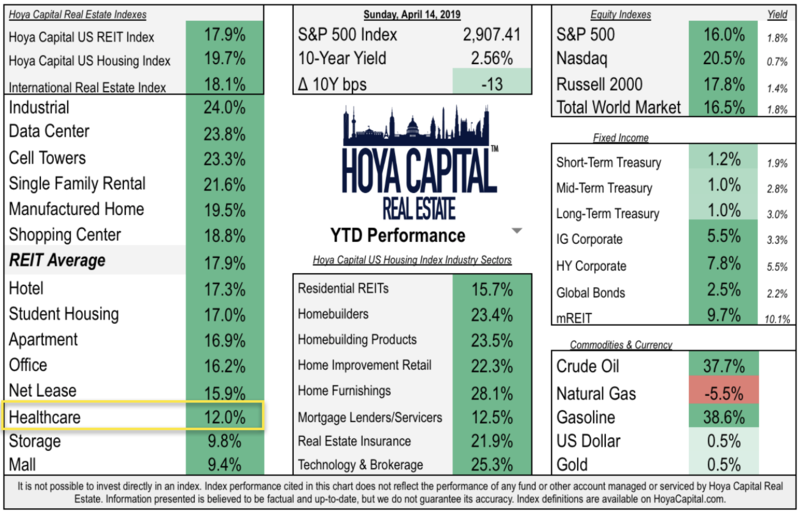 All commentary published by Hoya Capital Real Estate is available free of charge and is for informational purposes only and is not intended as investment advice. Data quoted represents past performance, which is no guarantee of future results. Information presented is believed to be factual and up-to-date, but we do not guarantee its accuracy. Hoya Capital Real Estate advises an ETF. Real Estate and Housing Index definitions are available at HoyaCapital.com.